What was once just a gallon of milk now has a most fascinating back story. I recently had the pleasure of visiting several dairy farms in Minnesota at the invitation of Midwest Dairy Association. The passion, I witnessed, by these farmers for their cattle and land was just incredible. I was really surprised how seeing these farmers in action, so aligns with how I approach my own work today. We both work to ensure we are putting the best products on our tables for our customers…and the work they do every single day is truly incredible. Happy cows product more milk! Who knew? The visit began with a trip to Zweber Farms, a farmer owner of the cooperative, Organic Valley. The farm has been in the family since 1906., and they participate as a family to keep this business thriving. They work with assembly line like precision to ensure the cows are healthy, well fed, and happy. There are well defined routines that occur for the herd and the family to ensure quality milk production. Behind them is feed bailed and stored, ready for the long winters. On an organic farm cows are required to graze in pastures at least 120 days a year which can sometimes be difficult in the north where short summer seasons can limit the field grass growth. The Zweber’s made the choice to go organic in the mid 2000’s as a means of differentiation in a crowded market of local dairy farmers. The strategy appears to have paid off. The Zweber’s also sell eggs, beef and pork directly to customers. The second farm I visited illustrated a true labor of love. This farmer genuinely has a love for his animals and it showed in his enthusiasm for their care and feeding. Talking about how they create special feed for young, older and pregnant cows. But dairy farms are more than just about the cows. These farms pass from generation to generation and each generation works to improve the processes and environment handed down. They carefully rotate the crops every year, in all fields, to ensure the nutrients in the land are not depleted and that the land will continue to provide for their herds and families. Another surprising practice is their stringent rules for manure (a natural bi-product of owning large animals..duh:). They have strict requirements for the removal, storage, and recycling of their manure. Who knew you could recycle poo? These farms were amazingly clean and surprisingly not smelly. 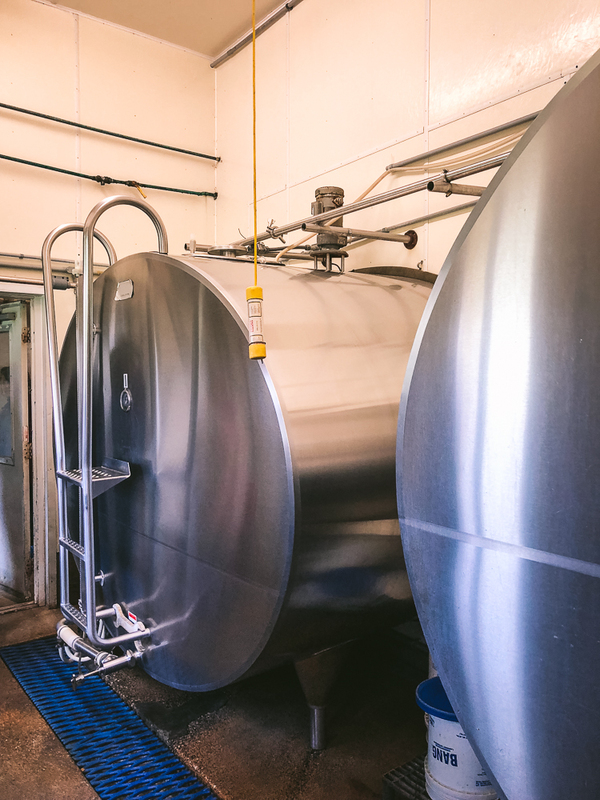 All work areas are constantly sanitized to ensure the milk meets rigorous testing required by the government agencies regulating dairy production for commercial consumption. Every single tank of milk that leaves a farm is tested before it is processed and sold. Milk (both organic and traditional) must be antibiotic and pesticide free before it is allowed to be sold and put into commercial distribution and /or further production. I was very curious about the differences between organic and non-organic milk. I was surprised to learn that the end product is virtually identical. What I learned is milk taste is most subtly affected by location of the farm, breed of the cow, variations in cows’ feed, and even the time of year. Is organic healthier? Research can find no difference between organic and regular milk in quality, safety or nutrition. Both contain nine essential nutrients. My trip was such a joy. It reminded me of the passion my father had with his farm in Virginia and I learned so much about dairy farming and production. I found such beauty in the land, cattle, farming process and the passion farmers have for their products, herds, and legacy. And remember, if you desire to support local, buy milk, either organic or traditional. Dairy isn’t shipped long distances and will always be a nutritious, safe product of a committed local farmer. So whether you go organic or traditional you still get to support your local farm! A sincere thank you to Midwest Dairy for the opportunity to tour, learn and connect with these awesome farmers.